Seven soldiers killed in an APC, three in a burning building. All the incidents were in Shejaiya, Gaza, where the IDF responded furiously. 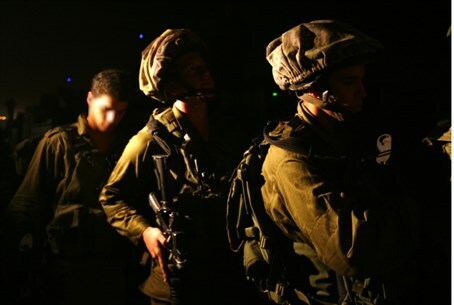 Thirteen IDF soldiers have been killed since Saturday night, the IDF said. The process of identifying the bodies is still ongoing. Golani Brigade, armor and engineering corps forces were met with effective close range guerrilla actions in Shejaiya, Gaza. The dead are all from the Golani Brigade. The Brigade's commander, Col. Rasan Alian, was also lightly injured. The IDF has released a timeline of the events early Sunday morning in which 13 soldiers from the Golani Brigade were killed in Gaza. In the first incident, at 1:05 a.m., an armored personnel carrier caught fire after an explosive device was set off under it. Seven soldiers were killed. Reportedly, the APC was not fitted with armor that can withstand this type of blast. At 8:50 a.m., three soldiers were killed when a Golani squad was caught insidea burning building. The IDF has also released videos of Golani operations in Gaza. The military said that the families of the soldiers who were killed have been notified. Their names will be released later on. Their deaths raised to 18 the total number of soldiers killed since the army began a major ground operation in Gaza late on Thursday. About 63 soldiers were wounded in the heavy fighting in Gaza since Sunday night. The residents of Shejaiya, a known hotbed of terrorists, were notified ahead of time by the IDF to leave the area because the IDF intends to enter it. Hamas had filled the neighborhood with booby traps well ahead of time, and the advance warning given by the IDF may have helped the terrorists there prepare for the IDF to enter. The heavy casualties dealt to the IDF and the need to evacuate the dead and wounded under fire apparently led to a furious response by the IDF, which the Palestinians are currently presenting to the world as a massacre. Currently there are 65 IDF soldiers being treated for injuries in hospitals around the country. Seven of the soldiers are in serious condition, three have moderate to serious injuries, and the rest have moderate or light injuries. In the twelve days of rocket attacks by Hamas since the beginning of Operation Protective Edge, Arab terrorists have fired about 1,000 rockets at Israel – and at least 130 of them have come from Shejaiya, where fighting has been heavy since Saturday, the IDF said Sunday. In the neighborhood are not just rockets, but also large amounts of weapons, and workshops for the production of missiles, the IDF said. Palestinian Authority chief Mahmoud Abbas was set to visit Hamas head Khaled Mashaal later Sunday. Abbas declared three days of mourning for the events in Sheijaya. Meanwhile, Hamas terrorists continued to fire rockets at Israel Sunday afternoon. Rockets were fired at Beersheva, Ashkelon, and southern Negev communities throughout the later afternoon Sunday.